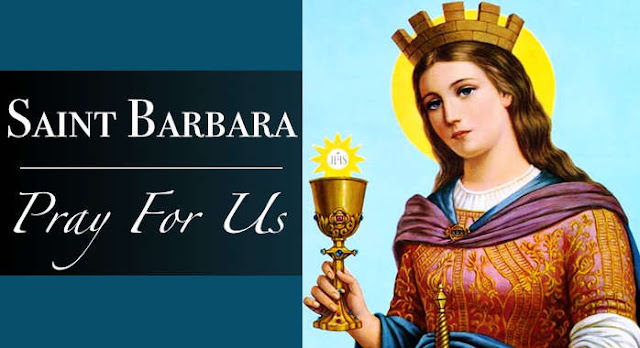 There is no reference to St. Barbara contained in the authentic early historical authorities for Christian antiquity, neither does her name appear in the original recension of St. Jerome's martyrology. Veneration of the saint was common, however, from the seventh century. At about this date there were in existence legendary Acts of her martyrdom which were inserted in the collection of Symeon Metaphrastes and were used as well by the authors (Ado, Usuard, etc.) of the enlarged martyrologies composed during the ninth century in Western Europe. According to these narratives, which are essentially the same, Barbara was the daughter of a rich heathen named Dioscorus. She was carefully guarded by her father who kept her shut up in a tower in order to preserve her from the outside world. An offer of marriage which was received through him she rejected. Before going on a journey her father commanded that a bath-house be erected for her use near her dwelling, and during his absence Barbara had three windows put in it, as a symbol of the Holy Trinity, instead of the two originally intended. When her father returned she acknowledged herself to be a Christian; upon this she was ill-treated by him and dragged before the prefect of the province, Martinianus, who had her cruelly tortured and finally condemned her to death by beheading. The father himself carried out the death-sentence, but in punishment for this he was struck by lightning on the way home and his body consumed. Another Christian named Juliana suffered the death of a martyr along with Barbara. A pious man called Valentinus buried the bodies of the saints; at this grave the sick were healed and the pilgrims who came to pray received aid and consolation. The emperor in whose reign the martyrdom is placed is sometimes called Maximinus and sometimes Maximianus; owing to the purely legendary character of the accounts of the martyrdom, there is no good basis for the investigations made at an earlier date in order to ascertain whether Maximinus Thrax (235-238) or Maximinus Daza (of the Diocletian persecutions), is meant.